US rapper Nicki Minaj refused to take to the stage of a Shanghai music festival last weekend after reportedly discovering the event was an unauthorised copy of Indonesia's biggest dance music festival. DWP China had been billed as the first China version of the Djakarta Warehouse Project, an annual dance music festival held in Indonesia which has evolved into the largest electronic dance music (EDM) event in Asia, attracting upwards of 45,000 people each day. 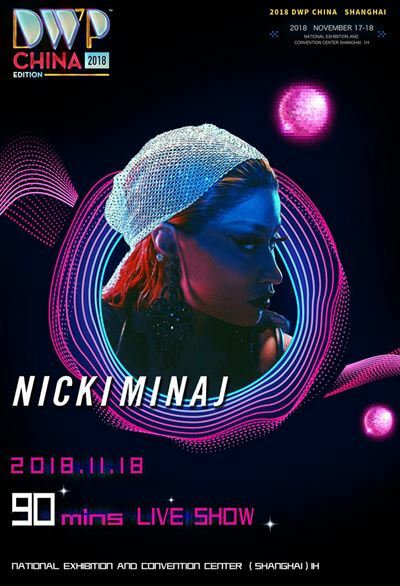 Minaj had been billed as a headliner of DWP China, alongside Despacito singer Luis Fonsi and EDM acts DJ Snake and Blasterjaxx, and the event took place on November 17 and 18 at Shanghai's National Exhibition and Convention Centre. Djakarta Warehouse Project organisers in Indonesia have been teasing the festival's China debut on the official DWP China Facebook page all year, but on November 16 they posted an image stating: "The event rumoured to take place in Shanghai on 17th and 18th of November 2018 is an unauthorised use of DWP trademark. DWP as a brand, has no association with the event." However, the announcement did not seem to reach Minaj and her entourage, who only learned about the allegations after arriving at the venue on November 18. The state-owned Global Times newspaper reported that the crowd of up to 1,000 people waited two hours for Minaj to appear on stage until organisers made an announcement that the American rapper had "refused to perform". Co-headliner DJ Snake also reportedly did not perform as expected. Nicki Minaj in a scene from "Super Bass" music video. On the DWP China Facebook page, one angry audience member posted: "DJ Snake didn't come. Nicki Minaj didn't come (the crowd waited two hours in the dark with no idea what was going on). This whole thing was a rip off. Only half the acts showed, the replacements were all local talent (which is fine but not worth the ticket price) … This was a clusterf***." However, concert organiser Yatai Huaying blamed Minaj for the fiasco. "Minaj failed to arrive on time, which severely delayed the show," the company said in a statement, adding that tickets ― costing up to 3,000 yuan (US$430) ― would be refunded. Before she left Shanghai, Minaj apologised to her fans in a video recorded at the city's airport. Meanwhile, organiser Yatai Huaying rejected claims by Djakarta Warehouse Project organiser the Ismaya Group that the Shanghai event was unauthorised. "Ismaya Group unilaterally publishes untrue messages on the internet in violation of the spirit of the contract," said Yatai Huaying, based in the city of Chengdu. The South China Morning Post has asked the Ismaya Group to clarify whether the Shanghai festival was connected to the Djakarta Warehouse Project.